I’ve always wondered what the food is like in Finland. Prior to our trip to Helsinki, I started looking into what type of foods we’d likely encounter there. I wasn’t even sure what the food culture was like there. Would fish and rye bread be the only foods we’d encounter? As with anything, preconceived notions are rarely accurate! Although food hasn’t always been high in the minds of the Finnish, these days there are more and more people talking about food in Finland, foodie ventures popping up, and the food scene is starting to evolve into something exciting and adventurous. One of my favorite things about Helskini and the food we found there was the smoked and grilled fish. At the Old Market Hall, we oogled over case after case filled with every imaginable type of fish, all beautifully grilled or smoked. There were more options there than I’d ever seen before. It was magnificent. We didn’t have time or stomach space to try them all, but I would have loved to stay for days and go back for a different thing each day. 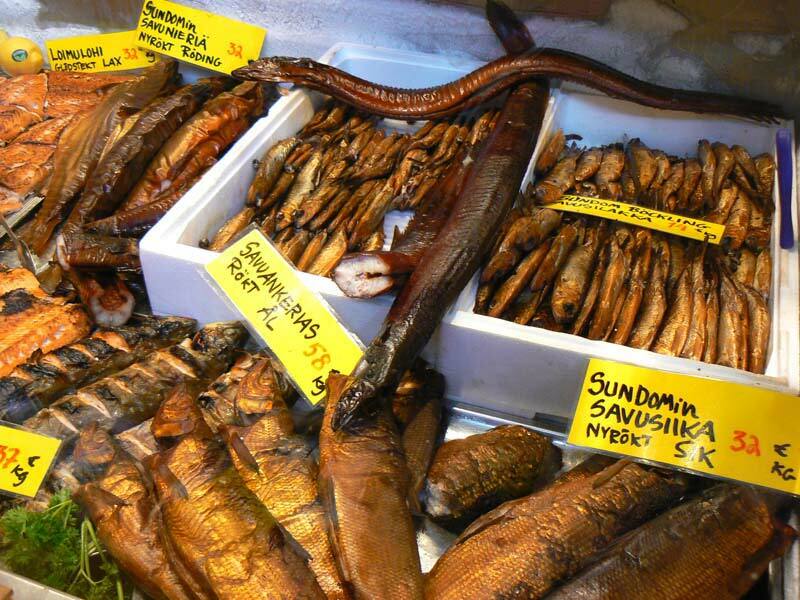 If there’s one thing Finnish eaters love, it’s smoked fish. Let’s be honest, you can get herring in just about any form in Finland – not just fried, but this is one of the favored ways of serving it, and I agree. On our trip to Scandinavia and Russia, we had our fair share of raw herring and I wasn’t too keen on it, so another open-faced fish sandwich was the last thing I wanted to eat again. But the fried herring is quite a bit different. It is bathed in a creamy, spicy batter, then slowly fried in butter until it’s crispy and delicious. 3. Reindeer soup, Reindeer jerky, Reindeer everything! I’ve never seen so many foods made with reindeer! We spent some time walking through the awesome Old Market Hall, where we were inundated with amazing foods we wanted to try – including many different versions of things containing reindeer – like the cream reindeer soup that came in a small can and reminded me of our clam chowder, and the reindeer jerky. It’s served dried, cured, grilled, stewed – you name it. These little hand pies are some of the most traditional foods you can find in Finland. They are a rye bread pastry filled with rice or other toppings, like pureed root vegetables. They are most traditionally served with egg and butter over the top. They’re eaten either for breakfast or as a snack and you can find them almost anywhere. We tried the ones in the picture above at tiny corner store called Kaartin Kotikauppa, which is the tiniest grocery I’ve ever been in. The ones we had were filled with a beet puree. And we got to sample it alongside a sparkling apple cider from Peders Aplagård, an apple farm in Southern Finland. Since we’re equal opportunity here at Savored Journeys, we can’t do a whole list of foods without including at least one drink. Sima is a traditional May Day drink in Finland. It’s something like a home-brewed fermented lemonade. It’s made by steeping sugar and lemons for a short period of a couple days until its slightly fermented. Of course, as a fermented beverage, there’s an alcohol percentage, but we’re talking a very low percentage, something like 1%. It’s a bit fizzy and tastes very mild, like mead. It’s traditionally served with a little pastry that looks similar to funnel cake, called a tippaleipä. Aamupuuro means “morning porridge” in Finnish, and it’s definitely a staple of breakfast in Finland. We visited a cute little shop that served porridge every morning along with all of the required topping choices. Typically, a big bowl of hot porridge would be topped with a pat of butter and some fruit preserves, but there are many other options, like dried fruit, nuts, sugar, cream and even chocolate. There are many different types of porridge in Finland, not to be confused with the morning version, including a black rice version that is served as a traditional Easter dish. Mustikkapiirakka is a Finnish blueberry pie sometimes made with sour cream or yogurt in the filling. It’s a very popular dessert in Finland. It’s eaten most often in the summer when blueberries are in season. I’m not big into the gluten-free movement, but there are a few companies in Helsinki who are making gluten-free versions of Mustikkapiirakka, like the one we visited. The pie is made in many different ways and I got the feeling the one we had wasn’t the most traditional version. It had a pureed filling, which was creamy and smooth, on a crumbly crust. It was packed with blueberry flavor. You’ll see these in the market wrapped in tin foil and ready to bake in the oven. It’s rye bread filled with local small fish, like vendace or perch. The bread is baked for hours until everything is cooked through and hot. You then slice it to reveal the cross-section of the fish inside and serve it either hot or cold. Graavilohi is what we refer to as Gravlax. It’s a salt, sugar and dill-cured salmon that can be found in abundance all over Finland. It’s not served quite the way we do, for breakfast with bagels and cream cheese. Instead, it’s usually served as an appetizer, with rye bread and accompanied by hovmästarsås, a dill and mustard sauce. The grocery store we visited in Helsinki, Stockmann, had an incredible array of choices. I would have liked to try each of them. I’m not a big licorice fan, but the Finns definitely are! They have a candy called Salmiakki, which is basically salted licorice. It’s basically licorice flavoured with ammonium chloride, which is what gives it the salty flavor. Heather, our guide, offered it to us in the form of wrapped candies and said that she has to hide the dish of them at home or her son will eat them all. Obviously, you have to have a taste for black licorice in order to acquire a taste for these, but it is a traditional Finnish candy, so you have to give them a try. If you are a fan, you’ll be happy to hear that there are many different forms – soft and hard candies, Salmiakki-flavored ice cream and even a Salmiakki liquor. Now that we’ve made it through the ten foods I think you should eat while in Finland, I have to show you some of the other things we found on our trip that looked amazing. We visited the Stockmann’s grocery store, which had a massive selection in every department. I’ve never seen so much cheese, so many types of sliced deli meats, so many different types of potatoes. While it felt strange to be basically touring our way through a supermarket, it was really fun to see all the variety. Likewise, the Old Market Hall was a foodie paradise with dozens of things to sample and admire. The potato aisle – yes I took a picture of it! On our food tour, we tried a few other things that didn’t make my list, but that were really good. We went to a brewery called Brygerri, where we tried a bunch of their beers. We had a tasty plate of cheese at the Old Market Hall. And there’s a picture of the beer section at Kaartin Kotikauppa. Finally, whoever came up with the idea to create a sandwich using muffin tops was genius! So, I think this is sufficient evidence that Finland has some pretty good food to try. Of course, there are dozens of other specialties that a native could tell you all about, but as a food tourist, these were the things we were lucky enough to try and very much enjoyed. Do you have a favorite Finnish food? Tell us about it in the comments! Like this post? Pin it on Pinterest or share it on social media! This entry was posted in Food, Things to do and tagged Finland, food, Helsinki. Reindeer everything. Sounds like a good menu. There are so many tasty sounding foods on this list! The blueberry pie sounds delicious! I’ve bought a Swedish blueberry pie from IKEA which was good, so I imagine that it would be even better freshly made. I would definitely try the reindeer soup as well. Valerie, I would think the Swedish blueberry pie is very similar to the Finland pie. There were a lot of similarities in the food in both places. The Dutch are very fond of licorice as well! I haven’t been to Finland, but would love to visit before we leave our temporary new home in the Netherlands! When I do visit, I want to grab some of those Karelian pies and Tippaleipa! Michele you should definitely try to make it there while in the Netherlands. You won’t have any trouble finding the Karelian pies. They’re everything. I spent a few days in Tampere but the only thing I tried food-wise that was a little different for me was blood sausage. It was definitely interesting! We saw a lot of blood sausage too. Once you get over what it is, it’s really quite good. I loved Finland, especially for the food while we were there. Smoked fish was the best! Lol and I LOVE that you included “Reindeer” everything, because it literally is the truth! They were selling reindeer burgers at McDonalds while I was there, and I swear I ate reindeer on a pizza!! I showed this to my girlfriend who is from Finland. I haven’t been yet, but I hope to go before Christmas this year. Told her she better show me all these foods (except maybe the fish pie.. Not sure how I’d do with that). I like Salmiakki. I’ve had the licorice and the liquor before. Finnish people are crazy about their licorice! It’s weird because black licorice is NOT popular whatsoever back home. Elliott – I hope you get to Finland this year! I’ve never been a big fan of black licorice, so I don’t get it either. I especially love the names of the dishes. It must have taken a while to write them without any mistakes 🙂 Of all the dishes, the reindeer everything looks the nicest to try, especially the reindeer jerky. About the licorice, I prefer the salty ones, so I would love to try the finish version of it. Hah, you’re right, it was! I had to double check on everything. I’ll leave that licorice to you, then. I’m not a big fan.